Sandeep Unnikrishnan was born on 15 March ,1977,and did his schooling from Frank Anthony Public School in Bangalore.Right from a young age ,he showed a desire to join the army.He expressed this by styling his hair in a crew cut! His teachers and peer recall him as being a good athlete,so much so many of his athletic records remained unbroken years after he had left school. Sandeep gruduated from school in 1995 and then went on to join the National Defense Academy(NDA) from where he passed out as a graduate of the 94th course.His NDA friends remember his as a selfless ,generous,calm and composed person.His Happy-go-lucky face masked a ruthless and determined soldier.He had a thin physique which a tough,never-give-up spirit,that was noticed in various training camps and cross country races he participated in during his NDA day. He was commissioned as Lieutenant to the 7th Battalion of the Bihar Regiment(Infantry) on 12 July 1999.After serving the Indian Army in different location in Jummu and Kashmir and Rajasthan to counter insurgencies for two terms,he was selected to join the National Security Guards(NSG).On completion of his training,he was assigned to Special Action Group (SAG) of NSG.He was a popular officer,who was loved and respected by his seniors and juniors alike. At the 'Ghatak' course at the Commando Wing,he topped the course earning 'Instructor Grading' and commendations form his seniors. Perhaps his passion for bravery led him to opt for the NSG Commando service, Which he joined on deputation in 2006. During Operation Vijay in July 1999, he showed grit and determination at the forward posts in the face of heavy artillery firing and small arms fire by the Pakistani troops. On the eve of 31 December 1999,Major Sandeep,then a Lieutentent,led a team of Six soldier and managed to establish a post just 200 metres away from the enemy. 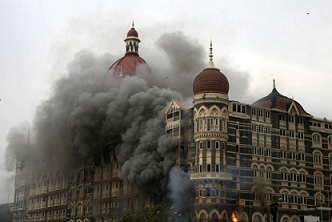 On the night of 26 November 2008,seven iconic building in South Mumbai were attacked by terrorists. Major Unnikrishnan was a part of the team of Opration Black Tornado,that swung into action at the Taj Hotel. He entered the hotel with a group of ten commandos and reached the sixth floor through a staircase.As the team came down the stairs,they sensed the terrorists had held a few woman as hostages in a room and locked the room from inside.When the Commandos broke open the door,the terrorists resorted to firing,In the encounter that followed ,Commando Sunil Yadav,Major Unikrishnan's Partner,got hit.Major Unnikrishnan arranged for Commando Sunil Yadav's evacuation and without fearing for his own safety,he chased the terrorists,who,in the meanwhile,has escaped to yet another floor of the hotel.Through all this,he continuously engaged them in combat.Unfortunately in the cross change of fire,he was shot from the back.He was severly injured and finally lost his life in the battle gun. 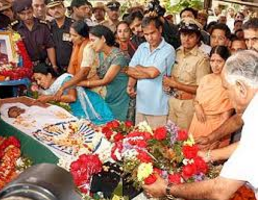 Thousand turned up to pray homage to this braveheart who was cremated with full military honours.The nation honoured his Posthumously(honoured after one's death) with the prestigious Ashoka Chakra on 26 January 2009. His father K.Unnikrishnan said 'A soldier's job is not a job, but a service.If one takes up a job just for money ,there are many jobs one can do.The best way to serve the country is by protecting its people.Sandeep was a soldier and he did his job well.I'm very proud of him'.He further added,"my son has instilled the feeling of nationalism and patriotism in me which I will always remember'.